Algae are photosynthetic organisms somewhat like plants in structure at a cellular level, but rather different in many other regards. For a start, many algae are single-celled organisms, and these are the ones that form a slimy layer on solid objects including the glass walls of your aquarium. Others are multicellular, but compared to plants they are much simpler in structure, without things like roots, leaves or stems. The edges of the leaves of this Anubias plant are fringed with hair algae. 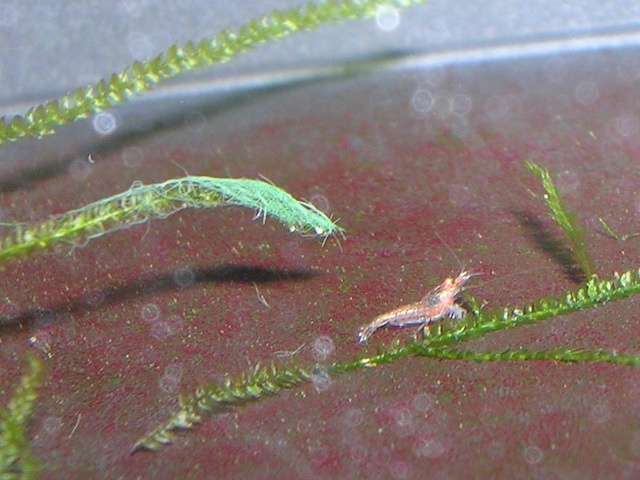 There are also spots of red algae on the leaves, and a thick mat of blue-green algae is developing on top of the hair algae as well (most noticeably on the right, behind the cherry shrimp. Why do you have an algae problem? Like plants, algae use light to convert water, carbon dioxide, and dissolved mineral nutrients such as nitrate into the organic chemicals they use to build their bodies. In very broad brush terms, if there are fast-growing plants in an aquarium, they will use up the carbon dioxide and dissolve nutrients before the algae can, so tanks with populations of fast-growing plants rarely have major algae problems. On the other hand if a tank has plenty of light, carbon dioxide and dissolved mineral nutrients, but no plants, then algae will take advantage of the situation. Almost always, tanks with algae problems are tanks with poor water quality, excessive amounts of light, and no fast-growing plants. In other words, algae are opportunists; they will only cause problems if we allow them to do so. Aquarists will encounter four main types of algae. These are diatoms; red algae, a group that includes brush algae and hair algae; green algae; and blue-green algae, more properly known as cyanobacteria. Diatoms are the algae the form the golden-brown slime on the glass walls of your aquarium. Only very rarely do diatoms cause major problems. Most of the time they are best managed simply by wiping them away with an algae scraper. As with other types of algae, they grow fastest in the absence of fast-growing plants. Various animals will eat diatoms as well, with snails being outstanding in this regard, particularly Nerite Snails. Diatoms commonly form a golden-brown slime on the glass walls of the tank, as seen here. The only time diatoms cause a headache is when they bloom. This turns the water cloudy, usually milky-white and is most common in newly set-up aquaria. Such blooms often come and go, a cycle that can persist for several weeks, even a couple of months. Eventually these blooms die down by themselves once the aquarium becomes more mature, and the assumption is that blooms occur in response to variations in water quality and water chemistry. If you want to get rid of an algae bloom quickly, use a UV-steriliser. Red algae are so named because when treated with alcohol, they turn red. So the fact that brush and hair algae are green or blue-black should put you off the idea that these are red algae, they are! In fact the marine forms often are red when still alive, but for whatever reason, most of the freshwater species are not. Tufts of brush algae can be seen along the back edge of the rocks shown here, as well as a thin scum of blue-green algae. Dealing with this class of algae is difficult because very few animals will eat them. Substantial clumps and tufts will have to be physically removed. Certain fish and snails will crop incipient tufts, preventing reoccurrence, but they will not get rid of established clumps. 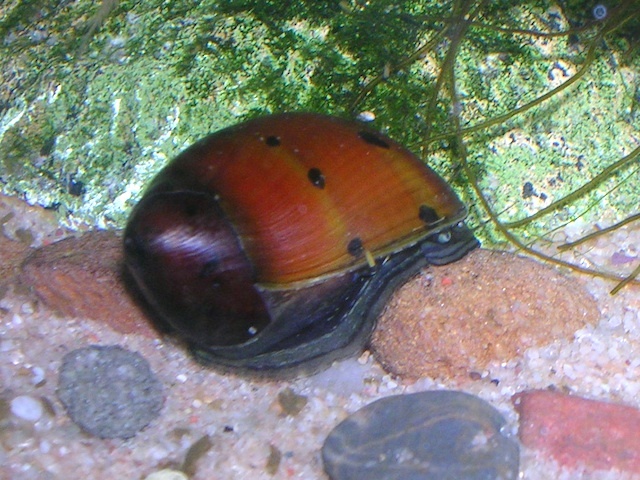 Notable species that eat red algae include Nerite Snails, the Siamese Algae Eater Crossocheilus siamensis, and the Butterfly Goodeid Ameca splendens. Red algae is one type of algae best prevented rather than controlled. The use of fast-growing plants will dramatically reduce the chances of red algae appearing in your tank. Good water quality will also help. Green algae are green, usually a bright, leafy green though there is some variation. 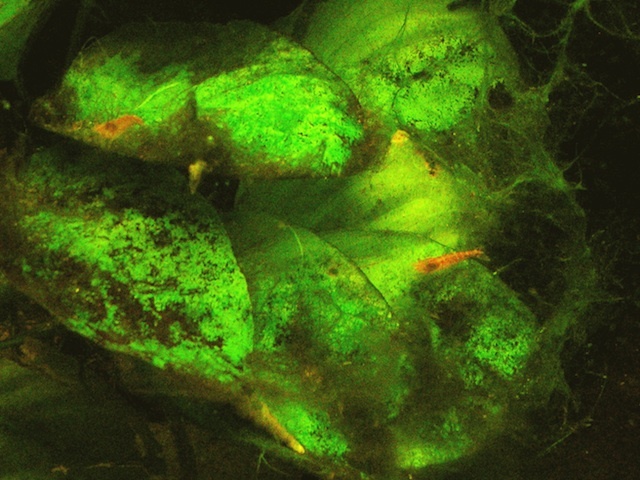 Green algae require precisely the same conditions as aquatic plants, and consequently only become noticeable, let alone problematic, in well-maintained, brightly-illuminated aquaria. They are typically seen in planted tanks simply because those are the tanks with the conditions green algae like. Green algae only tends to be a problem in planted tanks, because it appreciates the same conditions as flowering plants. Control is easy. Physically remove large clumps, and add suitable algae eaters to prevent unwanted regrowth. Small species are favoured because they are less likely to damage plants. Classic solutions include Nerite Snails; Siamese Algae Eaters; groups of Algae Shrimps, typically Caridina and Neocaridina spp. ; and schools of Otocinclus catfish. Almost all livebearers will consume green algae, though Mollies, Platies and Ameca splendens are among the most dedicated algae eaters. Ancistrus bristlenose catfish will also do a good job, but being rather large and clumsy, they tend to clean solid objects rather than plant leaves. These bacteria form algae-like slimes typically in areas with sluggish water flow, such as on the bottom of the tank and around the roots of floating plants. Blue-green algae outbreaks almost always get triggered by two specific things: direct sunlight and/or high levels of nitrate and phosphate. Blue-green algae has a distinctive thread-like texture when examined closely, as can be seen here, above the shrimp. Very few animals eat blue-green algae, so physical removal is required. Once removed, blue-green algae can be prevented from redeveloping by ensuring adequate water flow, controlling nitrate and phosphate levels, and adding plenty of fast-growing plants. The use of antibiotics such as erythromycin will kill existing patches of blue-green algae, but will do nothing to prevent new patches from developing. Like all bacteria, blue-green algae grow rapidly, so the use of antibiotics is a very short term solution and not recommended. There are many different ways to deal with algae problems. In some cases, more than one approach will need to be used. It should be stressed that without removing the underlying reasons for an algae outbreak, physical removal or poisoning will be a short term solution at best. Algae sponges and scrapers can be used to rub away diatoms from solid objects. 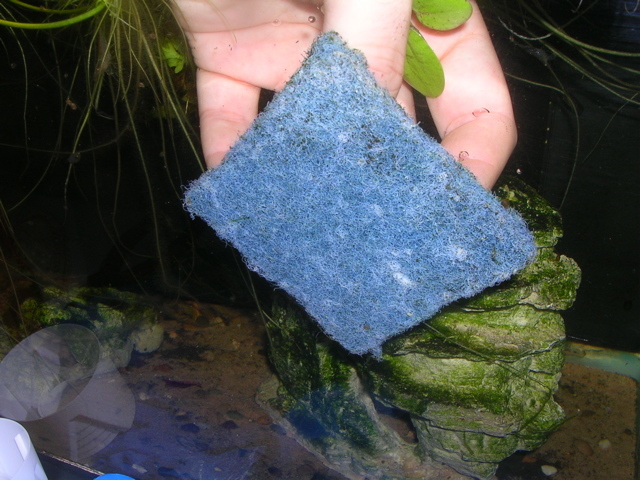 Some algae sponges designed for use on glass tanks may scratch acrylic tanks, so choose the right kind of sponge for your particular system. Algae scrapers may be either plastic or equipped with a safety razor blade that will need to be replaced periodically. The razor blade scrapers are especially good at removing stubborn algal growths from glass. Plant leaves with tufts of green or red algae should simply be removed and discarded. In cases where the algae is so thickly entwined around a plant that you can't remove just a few leaves, you may need to discard the whole plant. At the very least, remove all the leaves down to the base, and with luck, new leaves will appear after a few weeks. Use an algae sponge or scraper to remove algae from the front pane of glass. There's no particular need to remove algae from other surfaces, unless you want to. Rocks and bogwood can be cleaned with hot water and rubbed down with an abrasive sponge. Blue-green algae tends to clog up gravel and sand, and contaminated substrate should simply be siphoned or scooped up, and then either washed under hot water or thrown away. Being photosynthetic organisms, the more light they receive, the faster algae can grow. Blue-green algae in particular often appears in tanks that receive direct sunlight, in which case moving the aquarium should help fix the problem (as well as physically removing infected plants or substrate). However, controlling algae problems is more complicated than simply reducing the amount of light the aquarium receives. Surprisingly perhaps, increasing the amount of light may help fix persistent algae problems. All algae types do best in tanks where plant growth is slow or non-existent. The addition of fast-growing plants will suppress the growth of algae, but fast-growing plants need strong lighting, typically 2 watts per gallon, or even more. So to use that solution, you may well need to add an additional light or two to your hood! Adjusting how long the lights are switched on can help too. Aim for 10 to 12 hours; anything above 12 hours tends to promote algae rather than plant growth. The use of a "siesta period" can also be helpful. This is a break of about 2 hours between two 5-6 hour lighting periods in the middle of the day. For some physiological reason, plants adapt to this much better than algae. As with light, the relationship between nitrate and phosphate levels on the one hand, and the growth of algae on the other, is complicated. Algae will of course grow faster if there is plenty of nitrate and phosphate in the water than without them. But you can have relatively high nitrate and phosphate levels but little growth of algae if other factors, such as the presence of fast-growing plants, are against them. Limiting nitrate and phosphate levels will help to control the growth of algae, and will also allow you to keep delicate fish, like this Sturisoma catfish, more successfully. Nonetheless, lower nitrate and phosphate levels benefit freshwater fish as much as they do limit the growth of algae, so aiming for low levels is still a good idea. Regular water changes are important, if possible from a nitrate-free water source. Aim to keep nitrate levels below 50 mg/l, and ideally below 20 mg/l. Algicides are algae-killing chemicals that work against green algae, red algae, and diatoms. Antibiotics such as erythromycin specifically work against blue-green algae, which are, if you recall, bacteria rather than what might be called true algae. It's difficult to recommend these products. There are two key issues. Firstly, all they do is kill the algae in the tank right now. If conditions remain the same, new colonies of algae will grow back within a few days, and within a few weeks you'll be back where you started. The other big problem is that algicides are, at some level, toxic. They can certainly harm plants, and may harm delicate fish and invertebrates. Even if the chemicals themselves don't harm your livestock, mounds of dead and decaying algae will consume oxygen and mess up water quality. Algicides and antibiotics are best avoided. UV-sterilisers are sold primarily to control the spread of parasites. But they can also be extremely effective at combating algae blooms, both diatoms and green algae. They have little impact on other types of algae, however. UV-sterilisers are normally connected to the outflow pipe from an external canister filter, though other designs are available. The UV tube has a finite life, and if left running all the time will need to be replaced every 6-12 months. If you only have occasional blooms, then you may prefer to switch the steriliser on for a few weeks when it's required, and leave it switched off the rest of the time. Blue-green algae in particular does best in pockets of still water. If you find blue-green algae forming sheets on the substrate in the corners of the tank, or around the roots of floating plants, or across the leaves of stem plants, the water current may be the problem. Increase water current using additional filtration, powerheads or airstones. Precisely why fast-growing plants inhibit the growth of algae is not clear, but they do! One possible explanation is that fast-growing plants absorb nitrate and phosphate from the water much more rapidly than algae, meaning that they grow while the algae doesn't. The other explanation is based around the concept of allelopathy, that plants produce chemicals that actually suppress the growth of algae. Fast-growing plants include things like Cabomba, Ceratophyllum, Elodea, Hygrophila, Rotala and Vallisneria. Floating plants such as Indian Fern (Ceratopteris thalictroides) and Amazon Frogbit (Limnobium laevigatum) are also very good algae-busting plants, and because they float, they can be added to aquarium where rooted plants are viable. It's worth mentioning the sorts of plants that aren't fast growing. These are things like Anubias, Cryptocoryne, Java fern and Java moss. Indeed, these plants will often get smothered with algae if placed in bright light and without the company of fast-growing plant species. While often assumed to be the first step to combating algae, adding algae eaters to your tank is a strictly optional move and might not even be a good idea in some circumstances. Adding new animals will always increase the amount of ammonia being added to the water, and that in turn means more nitrate. More nitrate means the algae can grow faster. So an algae-eating fish like a Plec out of all proportion to the size of the aquarium can very easily make a bad situation worse. Probably the best all-around algae eaters are Nerite snails. They constantly graze algae of all types, except blue-green algae, but do not harm plants, stay small, and don't breed under aquarium conditions. Allow 2-4 snails per 10 US gallons. So, it's important to choose the right algae eater for your system. 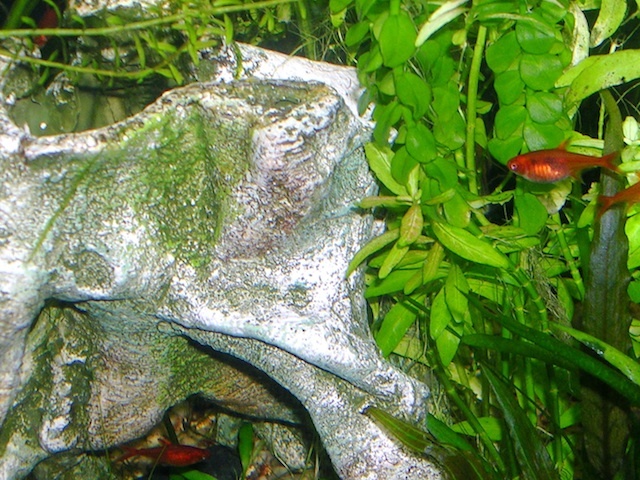 In planted tanks, and tanks less than 90 litres (20 gallons) in size, the best choices are invertebrates. Good species include Nerite snails, typically Neritina and Vittina species. These small snails are prettily marked and completely harmless towards plants. Shrimps are also good, including the very popular Amano Shrimps and Cherry Shrimps. 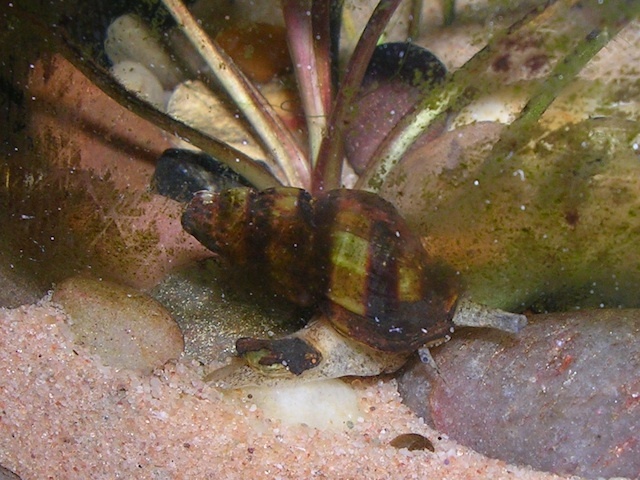 The benefit of snails and shrimps is that they aren't likely to uproot or damage plants while cleaning them very efficiently. Among the fish, Otocinclus are favoured by many, but these schooling catfish need to be kept in a mature aquarium with lots of oxygen and good water quality. 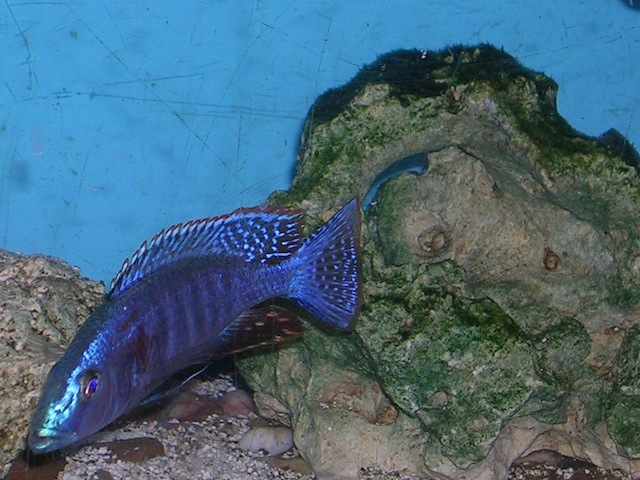 They eat little else other than algae, and often starve to death in community tanks. Because they're so delicate, they're not recommended for inexperienced aquarists despite being widely sold. Siamese Algae Eaters are a rather better bet, though they're quite a bit bigger and tend to be territorial unless kept in a group of six or more specimens. Garra species are also very good, though social behaviour varies between species from fairly peaceful and gregarious, as with Garra flavatra through to the much more feisty, as with Garra cambodgiensis. Ancistrus catfish can be excellent algae eaters, but adults are clumsy and won't do much to help control algae on delicate plants. 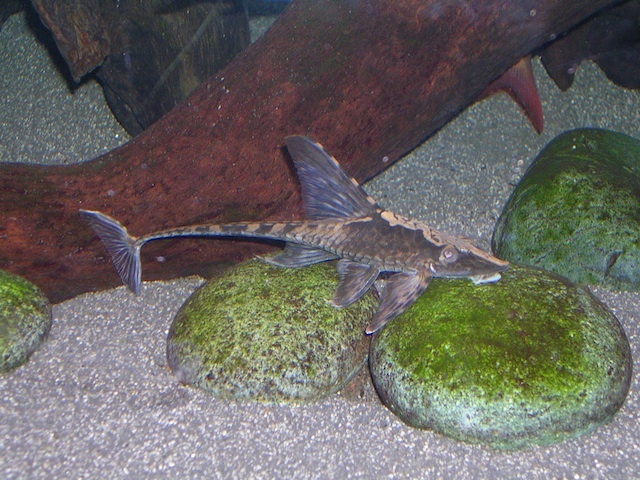 Avoid the bigger supposed algae eaters like Plecs (typically Hypostomus and Pterygoplichthys species) and Chinese Algae Eaters (Gyrinocheilus aymonieri). While they eat some algae when small, as they grow they become more omnivorous, and they also have a tendency to be territorial and aggressive. Being big fish, they also put a huge strain on filter systems, reducing water quality, and increasing the chance of algae problems. Preventing algae problems essentially comes down to getting a healthy balance between the fish and plants. Algae is most likely to be a problem in tanks with too many fish, inadequate water circulation, high levels of nitrate and phosphate, and excessive amounts of light. By contrast, tanks with lots of fast-growing plants tend to have few algae problems, and beyond scraping the glass and removing the odd leaf, algae is something that can be largely forgotten about. Algae isn't necessarily a bad thing; in the right places, it can be rather attractive, as with the tufts of green algae growing on a tadpole snail. While there's a tendency to view algae as something that needs to be tackled directly, through the use of scrapers and algicides, algae is best viewed as an indicator of overall aquarium health. If your tank is plagued with algae problems, it's entirely likely you have other problems to worry about as well.